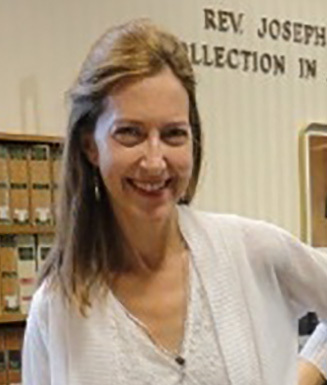 Sarah McNamer, Associate Professor of English and Medieval Studies (Georgetown University) is the recipient of the 2013 Bonnie Wheeler Fellowship. Professor McNamer’s project is a critical edition and translation of the short Italian version of the pseudo-Bonaventuran Meditazioni della vita di Cristo (Meditations on the Life of Christ, or MVC). Circulating throughout Europe in various Latin and vernacular versions, the Meditations was the most influential devotional text in the later Middle Ages, with over two hundred manuscripts surviving. Professor McNamer has discovered a neglected Italian version of this text (Oxford, Bodleian Library MS Canonici Ital. 174) which has never been edited or translated. This 31-chapter version of the MVC is more radical in its implicit incarnational theology, more woman-centered, and more lively and dramatic than the versions previously known. In addition, the text is likely to have been composed by a nun, and not by a Franciscan friar as has long been supposed. If the text was indeed composed in its original form by a woman, its historical significance is even greater, as it would then be among the earliest surviving prose texts composed in the vernacular by women in Italy. Professor McNamer’s discovery of the Canonici version is, as one scholar has put it, potentially “paradigm-shifting”; it is thus important to publish a reliable critical edition of this text, with a substantial introduction and facing-page English translation, as soon as possible. The Bonnie Wheeler Fellowship will help make this necessity a reality. Congratulations to Professor McNamer! A special feature of the Bonnie Wheeler Fellowships is the designation of a mentor, who is responsible for reading the work-in-progress of the fellow and for offering feedback, constructive criticism, and encouragement. Professor E. Ann Matter (Religious Studies, University of Pennsylvania), will serve as mentor to Professor McNamer; Professor Matter is the author of The Voice of My Beloved: The Song of Songs in Western Medieval Christianity (Philadelphia: University of Pennsylvania Press, 1990) and editor or co-editor of several important essay collections.